This mural, painted with oil on fibreglass, is the first of its kind to be created in Sherbrooke by the MURIRS organization. 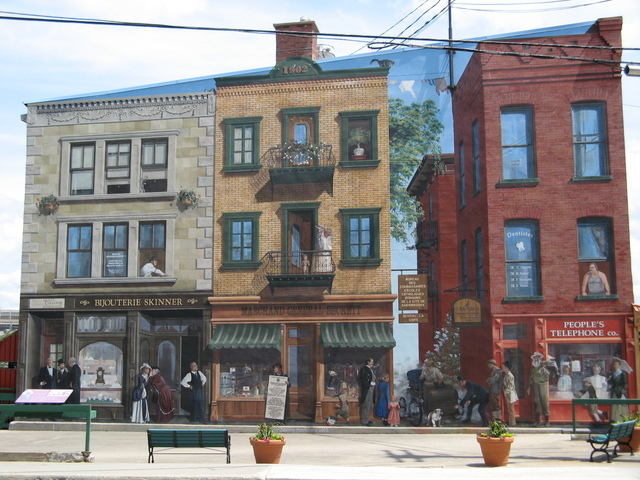 It was produced for Sherbrooke’s bicentennial. 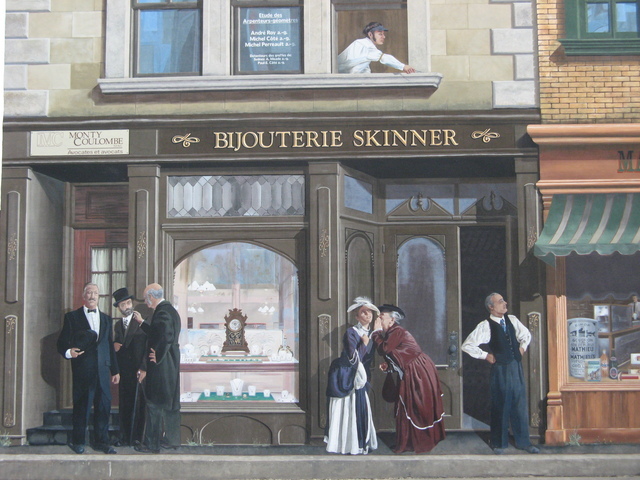 This work represents daily life around 1902, mixing reality and fiction. 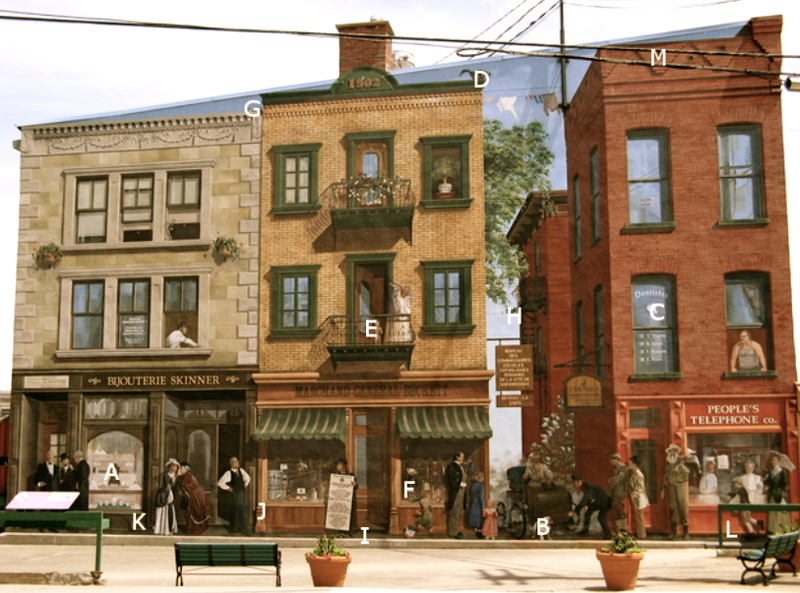 It shows a fictitious rendering of historical and imagined events, on the corner of Commercial St. and Factory St. (now Dufferin street and Frontenac street). Overall, 23 characters and a few animals are shown in their daily activities. 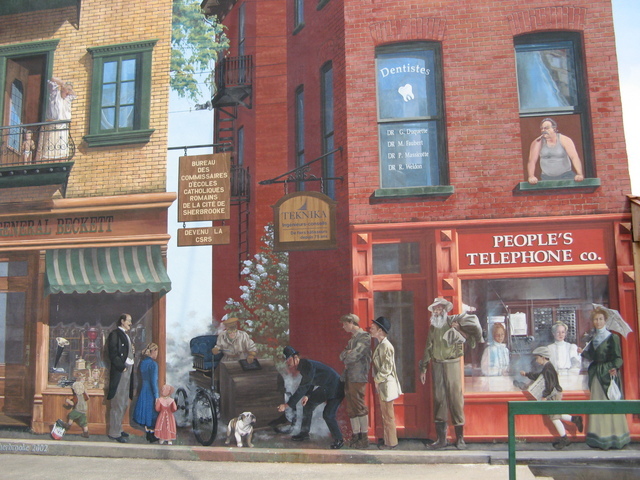 The mural is a tribute to business people, politicians, and community members from another era. It seems as if time stood still on this second day of June 1902 in Sherbrooke. To the left, Frank McCrea, pulp and paper baron and Daniel McManamy, Irish usinessman talk with Richard Heneker, Superintendent of the British American Land Company. At the door, we can see M. Carlos Skinner, Clockmaker. In front of the Bulldog, we can see Robert Davidson, police officer and fire chief. At the right, Mme Alice E. Steward, Superintendent of the Sherbrooke Hospital, witnesses the scene. 2002 Bicentennial - Find and Seek!